Google Wallet is finally here, allowing Sprint Nexus S users to pay with their smartphones at select retailers in New York and San Francisco. The launch makes Google Wallet the first major NFC mobile payment system to be embedded in a smartphone in the United States, but it certainly won't be the last. Other smartphone makers, wireless carriers, and credit card companies are looking to launch their own mobile payment services, setting up a possible showdown over who gets to handle your retail transactions. Isis is the name for an alliance between AT&T, T-Mobile, and Verizon Wireless, announced 10 months ago. In August, an Isis spokesman told Bloomberg that the service is on track for a mid-2012 launch, but wouldn't comment on a rumor that carriers had invested $100 million dollars in the joint venture. The alliance is now soliciting merchants to install payment terminals that will accept payments from Visa, Mastercard, Discover and American Express. Isis hasn't announced any specific smartphones that will support the service. The credit card giant has been taking baby steps toward NFC payments with its payWave system, which previously allowed contactless smartphone payments through a special microSD card or a clunky iPhone case. (Transit riders in New York and New Jersey can already try this system out.) Today, Visa announced that payWave will work with Google Wallet, but the company has bigger ambitions. Ultimately, Visa wants its system to work with any smartphone, any wireless carrier, and any financial institution. The on-again, off-again rumors of NFC payment capabilities in the Apple's next iPhone have been floating around since January, but solid details are hard to find. 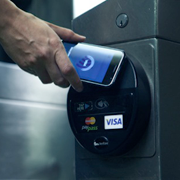 If the iPhone 5 supports mobile payments, it will surely shift the NFC business into overdrive. As it stands, we don't even know when the iPhone 5 will launch. Research in Motion and Microsoft have plans for NFC that are vague at best. RIM's latest Blackberry Bold is NFC-equipped, but carriers are reportedly blocking the capabilities with software. Microsoft was rumored to be working on NFC for Windows Phones earlier this year, but the company hasn't announced any details yet.